The 2018 Dirtbag Challenge kicked off on September 9th with a simple “GO! !” announcement on Facebook, setting this year’s Dirtbag ride and campout for November 9th to 11th. 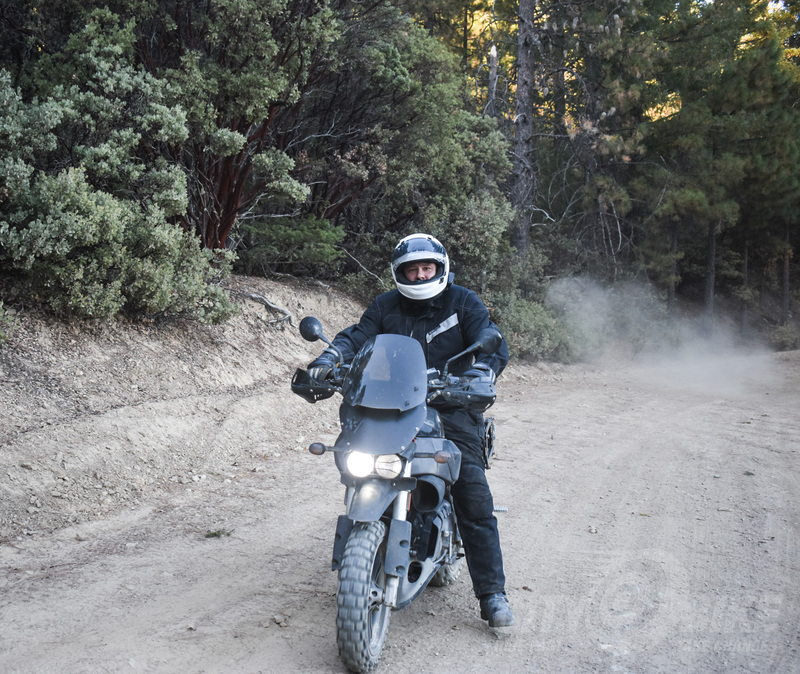 Locals know the story of the Dirtbag Challenge well, and in recent years the wider world of motorcycling has been introduced to the machines, characters and ethos of the event by media outlets hungry for authentic stories. Organizer Poll Brown and the other Dirtbaggers arguably sparked an honest-to-God movement, beginning with the original guidelines: $500 and two weeks to build a chopper, no Harleys allowed. The event grew rapidly, and the guidelines got looser—$1,000 and a month to build (but still no Harleys)—and eventually culminated in a massive burnouts-and-bands blowout in Hunters Point, one of the few still-ungentrified SF hoods, with over a thousand bikers and curious bystanders breathing bits of rubber as builders burned their rear tires into oblivion in celebration of low-buck independence. Surprisingly, the cops largely looked the other way, but Poll became disillusioned and in 2016 began shifting the direction of the Dirtbag. 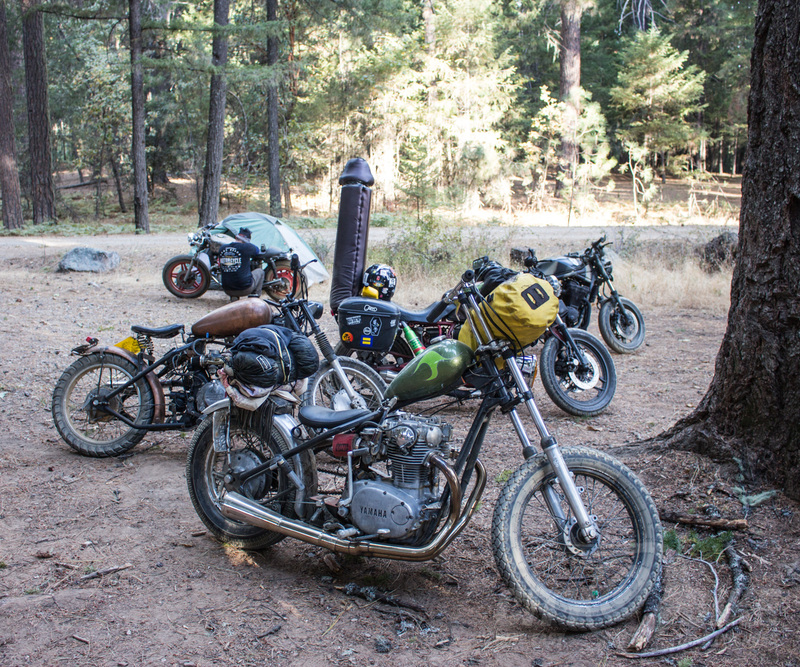 I rode along for the 2017 Dirtbag Challenge, my Buell Ulysses serving as something of a support vehicle, and the weekend firmed up my previously fuzzy notions of building a Dirtbag bike. As a “journalist,” I generally try to tell the story, not be the story, but that line blurred on day two of last year’s Dirtbag, when my Ulysses developed a flat tire on some dusty dirt road, resulting in one of my trusty TKCs slipping off the rear wheel. Setting the bead again required eight sets of hands, a ratchet strap, some shampoo, and a bicycle pump. If you’ve never tried to seat a big tubeless rear with a bicycle pump, I don’t recommend the it. With my Dirtbag community connection firmly established, I decided to actually build a bike this year. What am I cobbling together? Well, about two years ago, I was given a 2000 Polaris snowmobile equipped with a pull-start 550cc two-stroke twin and CVT transmission. 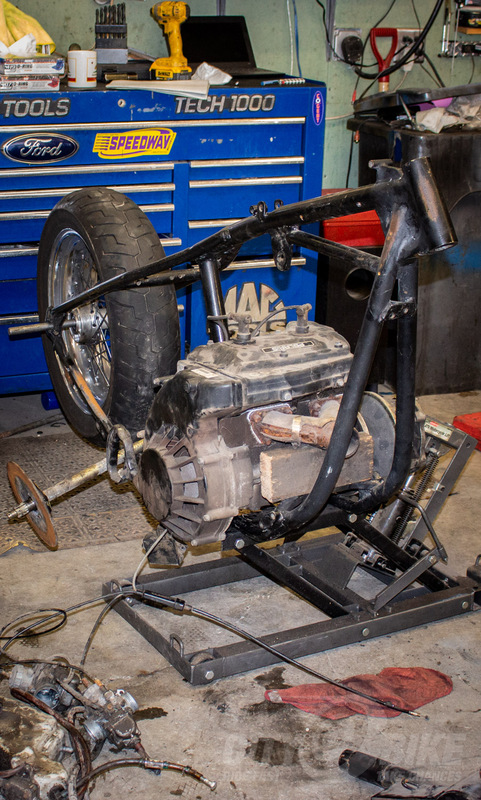 I’d previously planned to use that engine to build some sort of dirtbike death machine, just for fun, but other engagements got in the way and the engine was relegated to one of the darker shelves in my shop. After last year’s Dirtbag, I decided that I needed to revive that project. 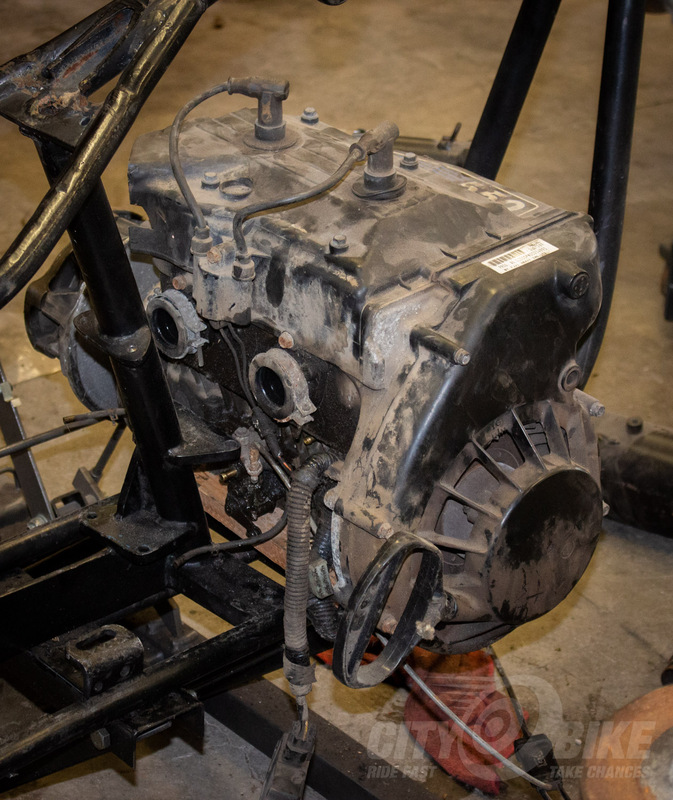 Several conversations happened, and I acquired a donor bike—our own Gwynne had a used-up Husqvarna 610 with a destroyed engine in a box. The Husky found its way into my back yard, and I found that it shares the same steering stem bearings with almost every Harley ever made. That made the inverted front end a likely candidate to graft onto my beloved FXR, but more conversations happened, and I finally settled on a plan. 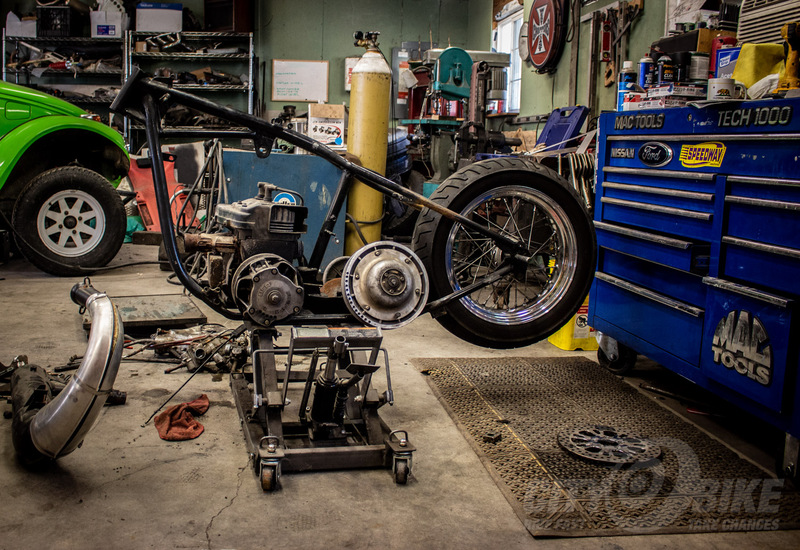 I’m building a snowmobile chopper! 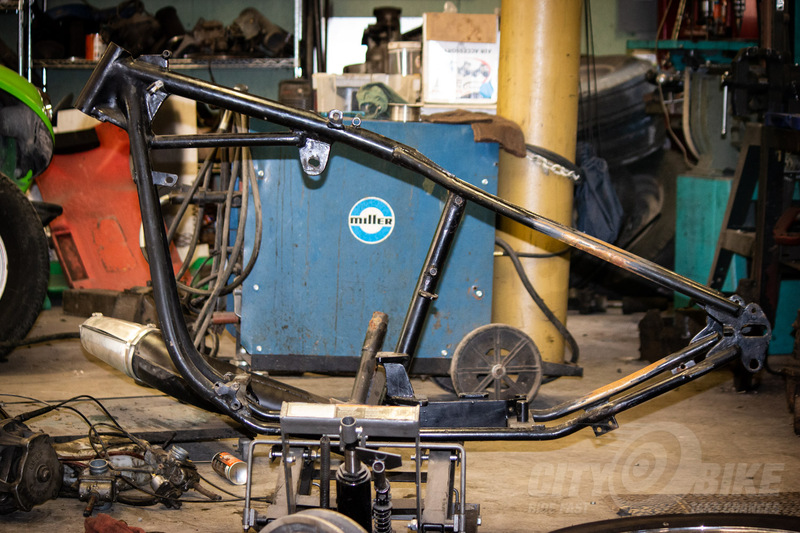 My father at some point bestowed upon me an aftermarket hardtail frame intended for use with a four-speed Harley Big Twin, but my somewhat nontraditional plans didn’t sit so well with my dad, so I’ve since had to pick up another frame from the depths of the “builder” community via Craigslist. That minor setback burned $300 of my $2,000 budget, but I’m still on a reasonable path to keeping this a truly low-buck build. A quick inventory of my parts stash reminded me that I was lacking an appropriate rear wheel. A Craigslist purchase solved that, and removed another $60 from my budget. At this point, I’ve got a reasonable pile of parts, a positive outlook, and a plan backed by a friend who’s a genuine mechanical engineer and snowmobile enthusiast. Another box of small parts is on the way from my father in Oregon, with an unknown price tag. Though he was unenthusiastic about me butchering the first frame, he’s got plenty of other junk that he’s okay with me bastardizing in the name of Dirtbaggery.